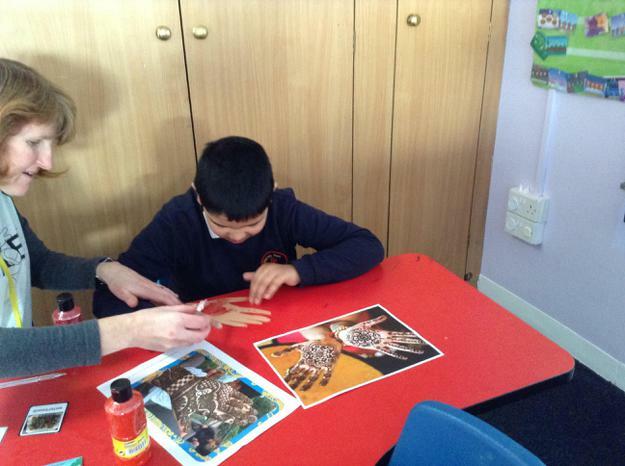 Our literacy activities this term have included developing our pre-reading skills such as pointing to and touching familiar pictures. 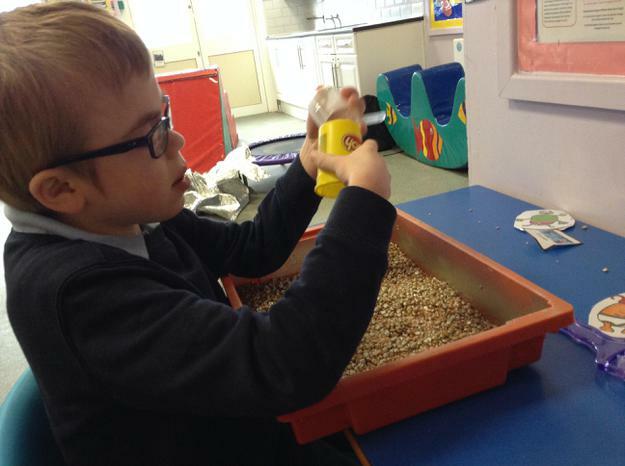 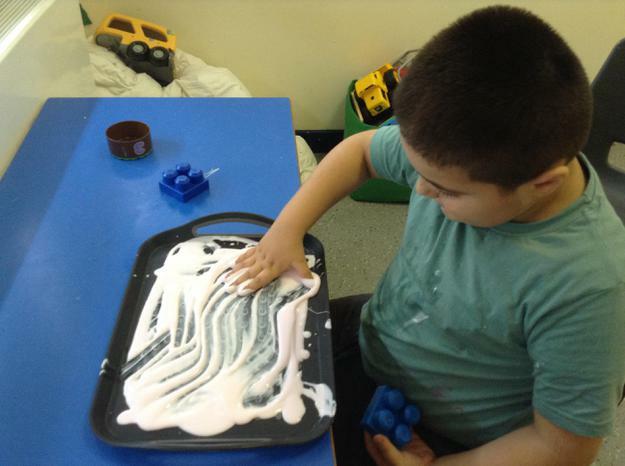 We have been developing our listening and attention skills during sensory activities that involve responding to simple instructions and requests. 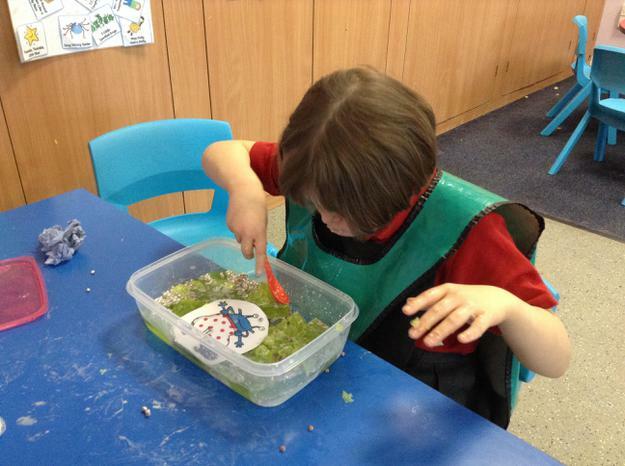 The children have also been working on their mark making skills and hand eye co-ordination during posting activities and using a hole punch to make caterpillar munch holes in fruit! 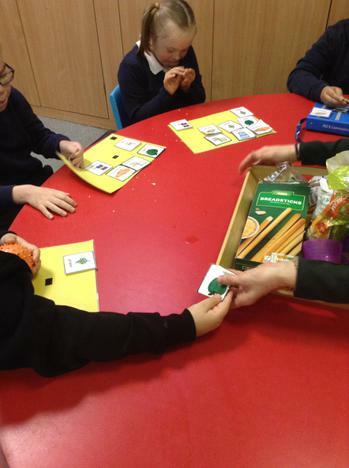 All of the children in Aqua class continue to make fantastic progress with using symbols to communicate their needs and this is encouraged throughout the school day at every opportunity. 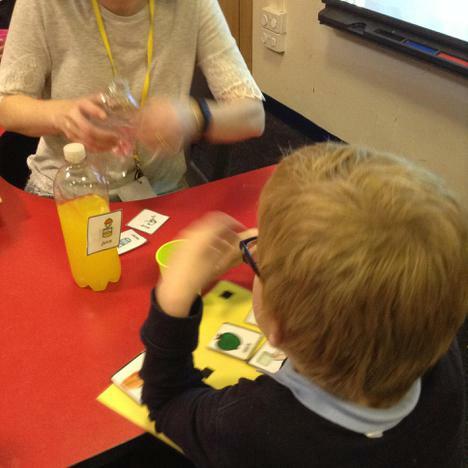 This term the children's literacy activities are going to be focused around stories, books and rhymes about celebrations. 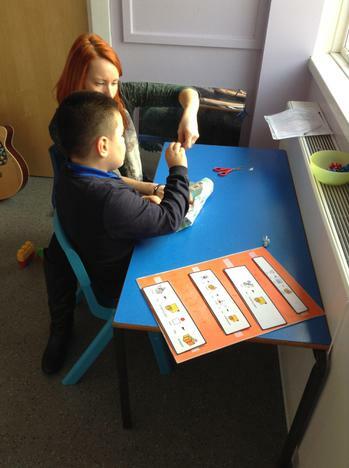 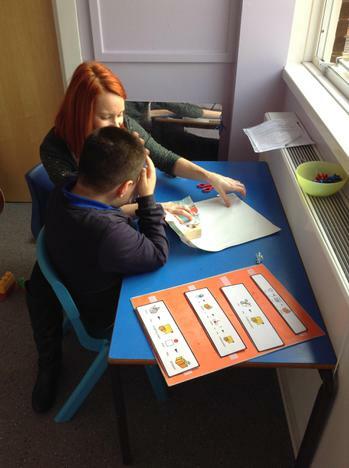 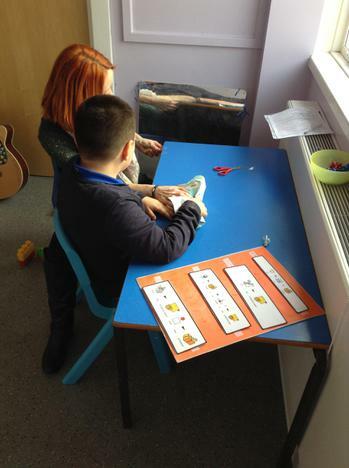 The children will be working on developing early reading skills such as pointing to and matching pictures and listening to and answering questions about stories. 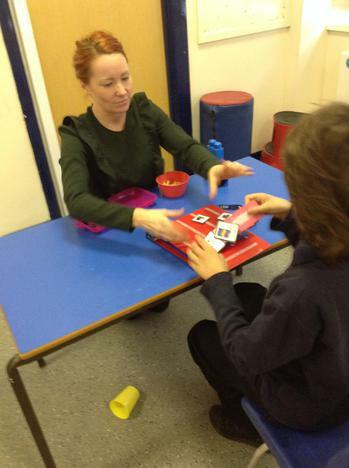 We have also been practicing following visual and verbal instruction when wrapping a present. 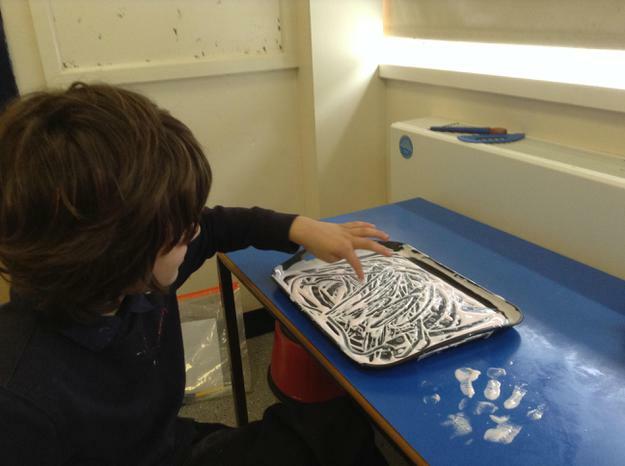 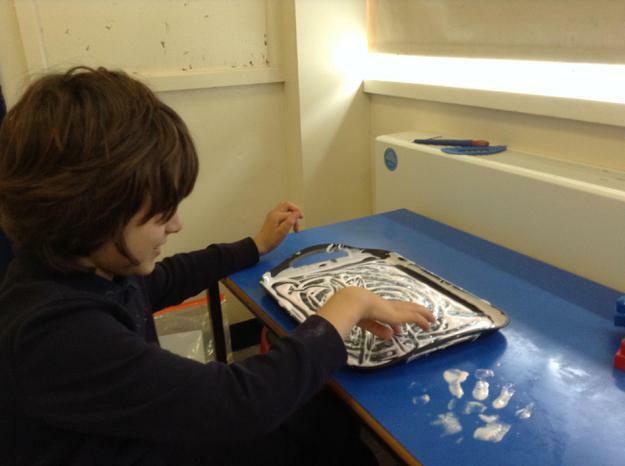 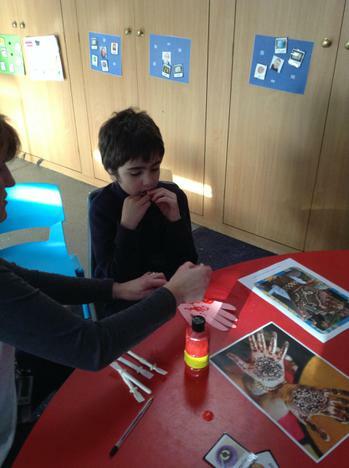 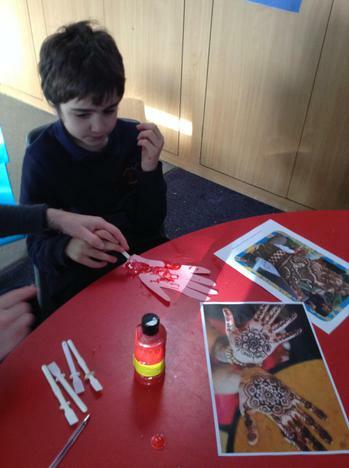 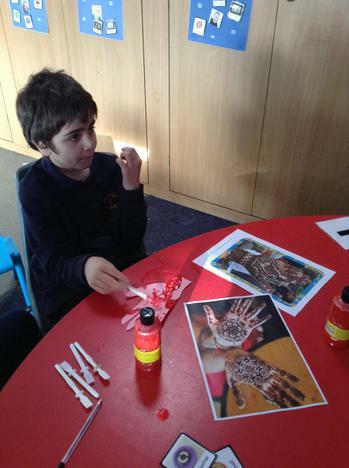 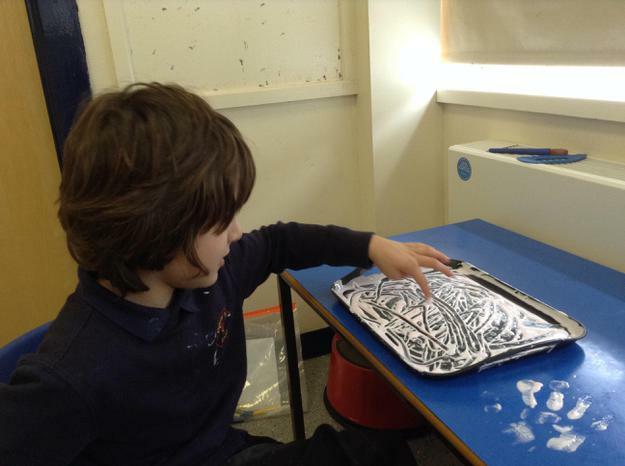 Our mark making activities have been linked to our RE lessons, we have made marks using glitter glue when creating Mehndi hand patterns and using rice when creating Rangoli patterns. 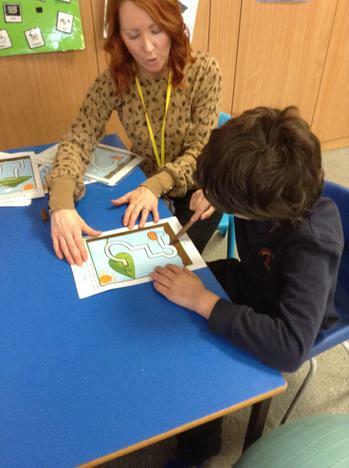 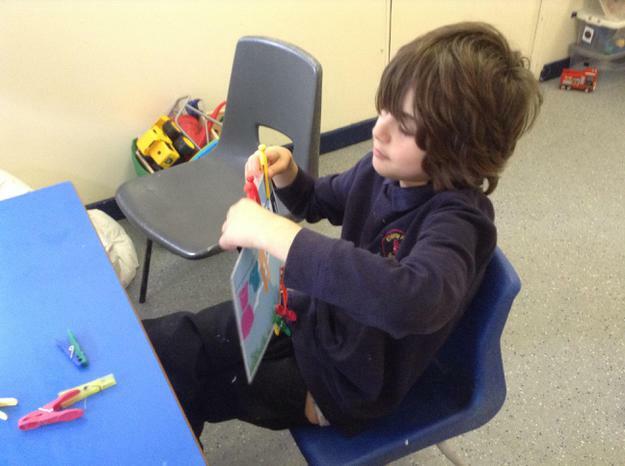 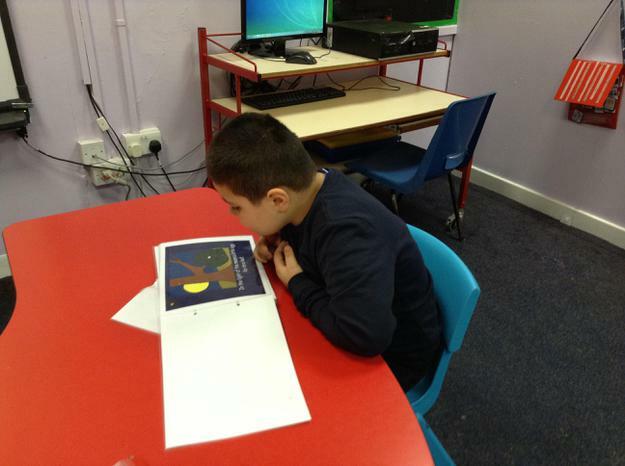 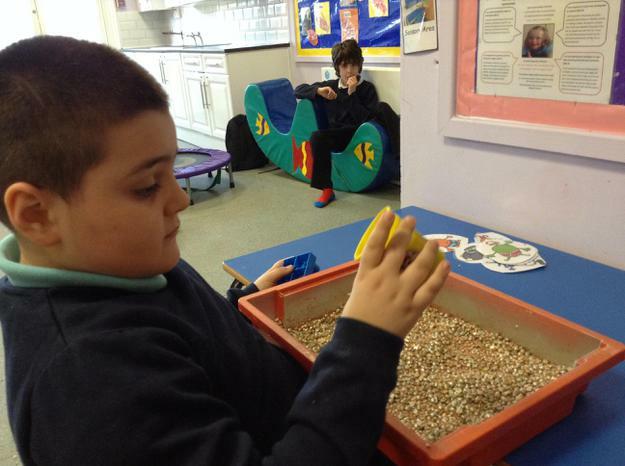 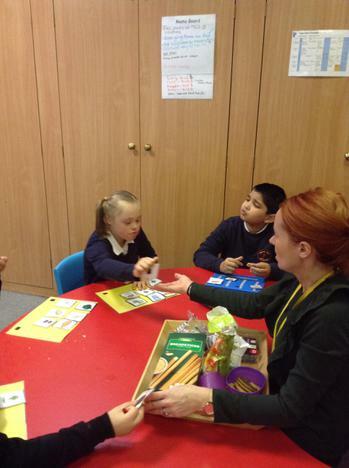 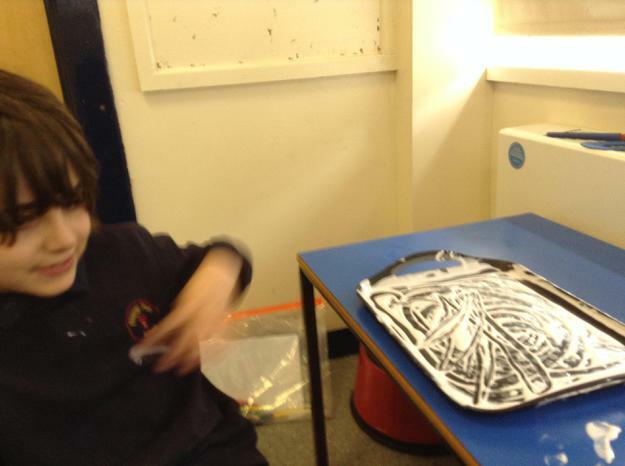 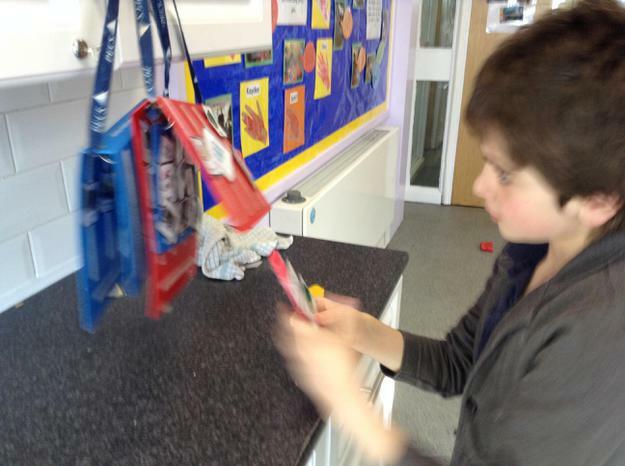 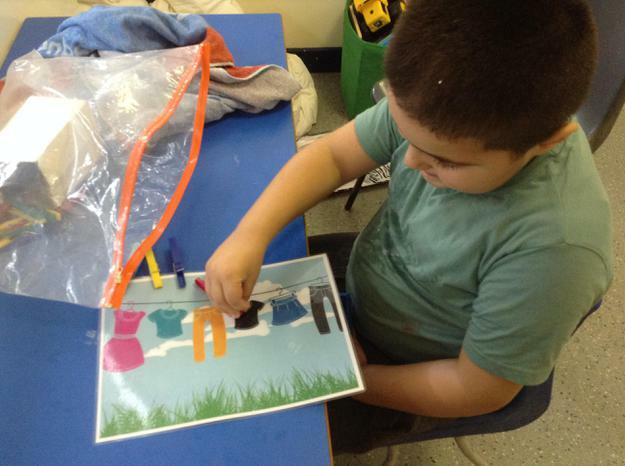 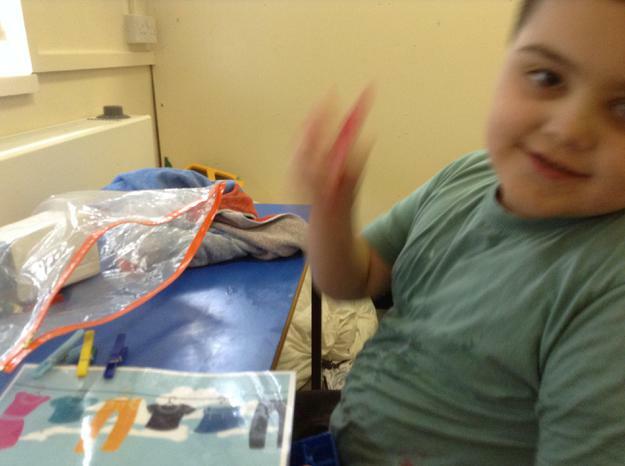 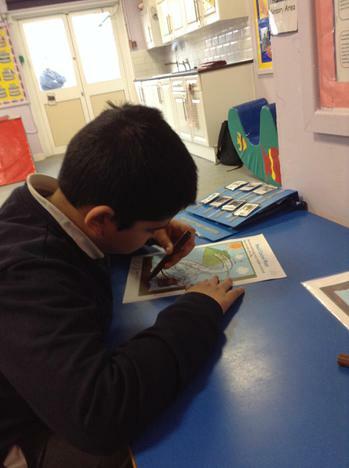 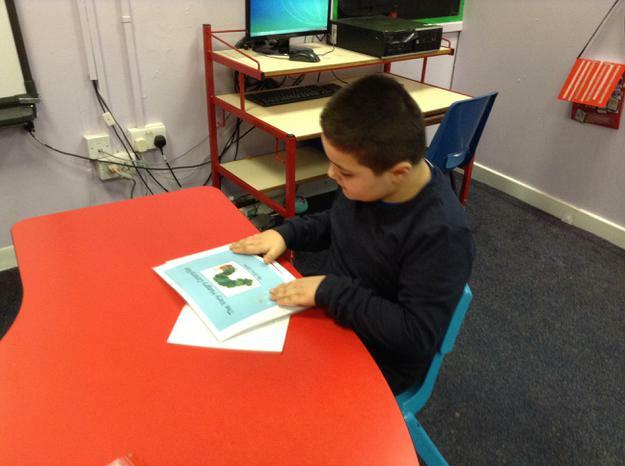 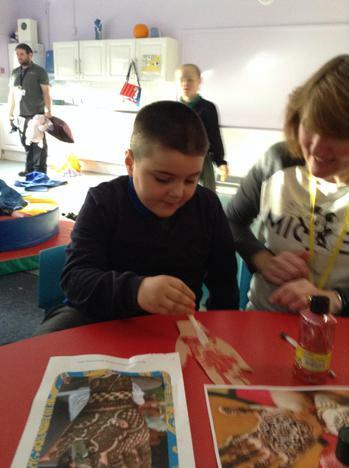 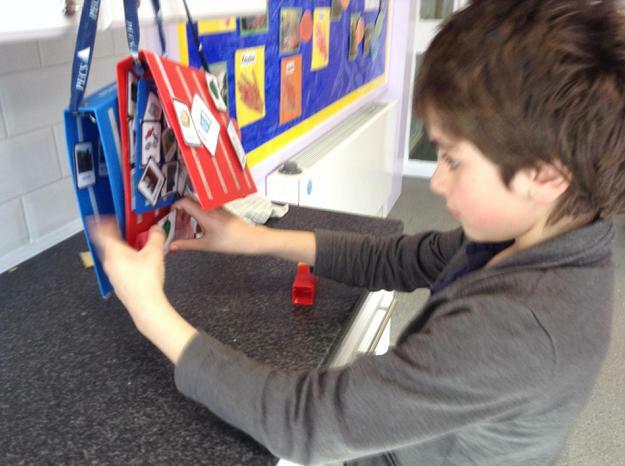 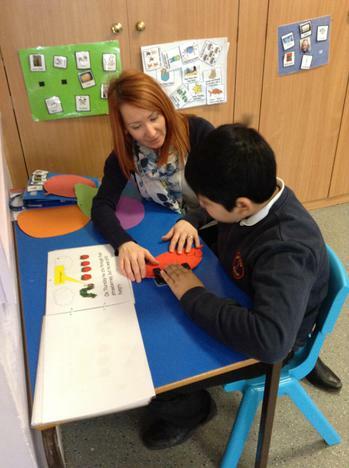 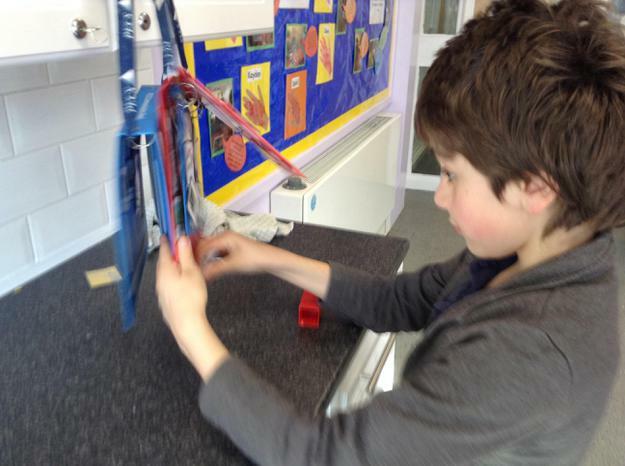 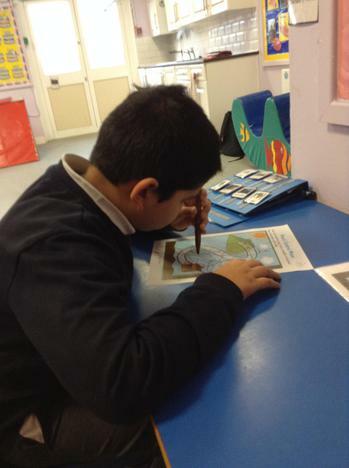 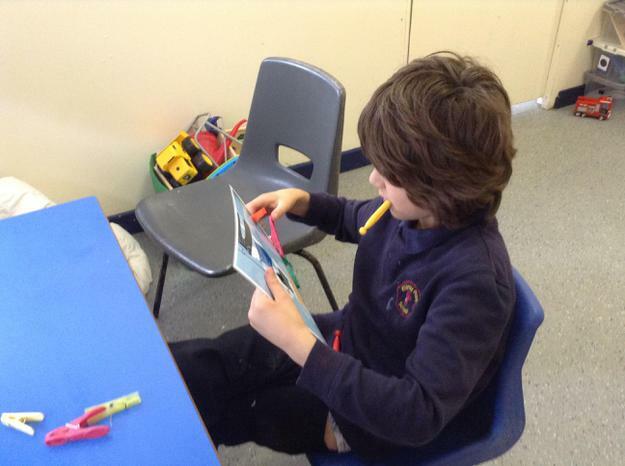 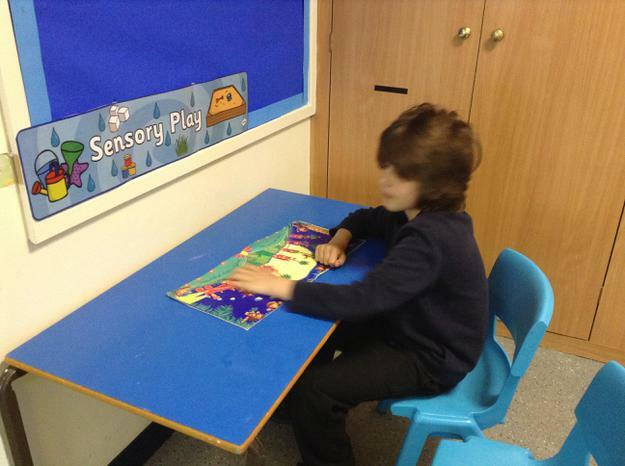 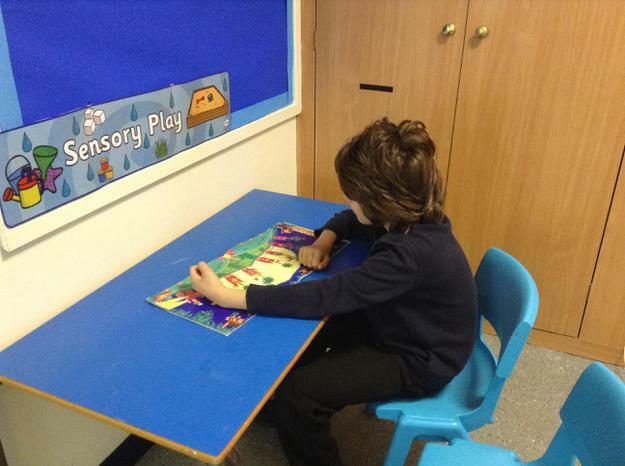 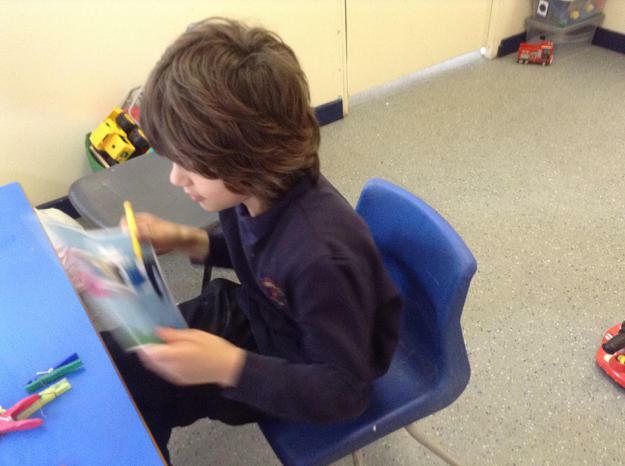 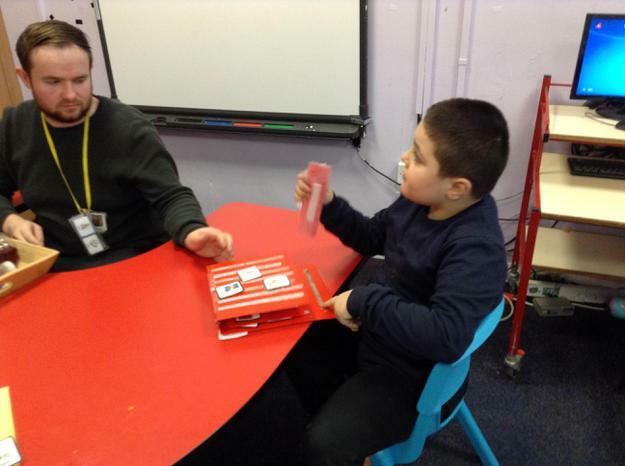 The children in Aqua class have been very busy during their literacy activities. 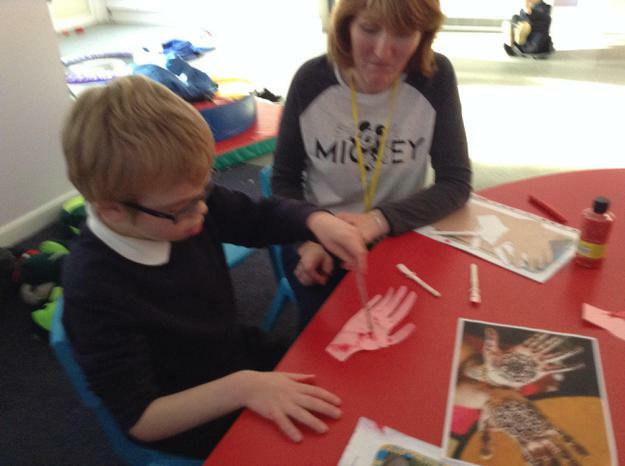 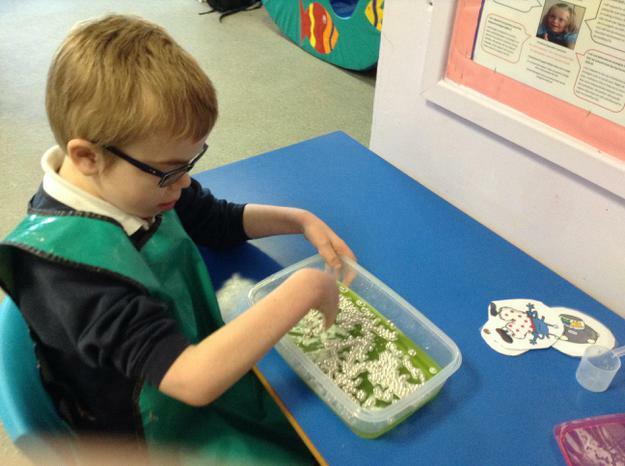 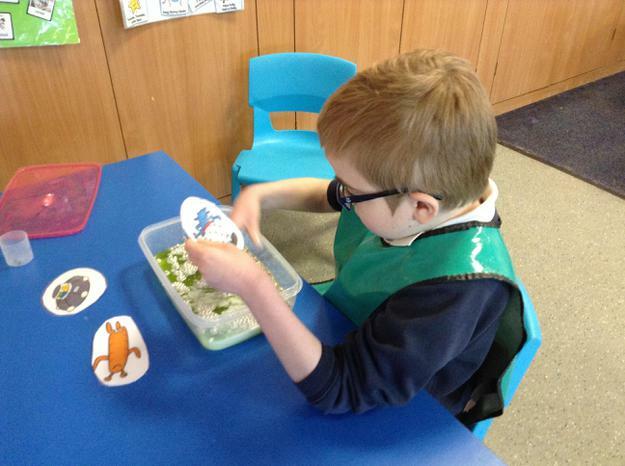 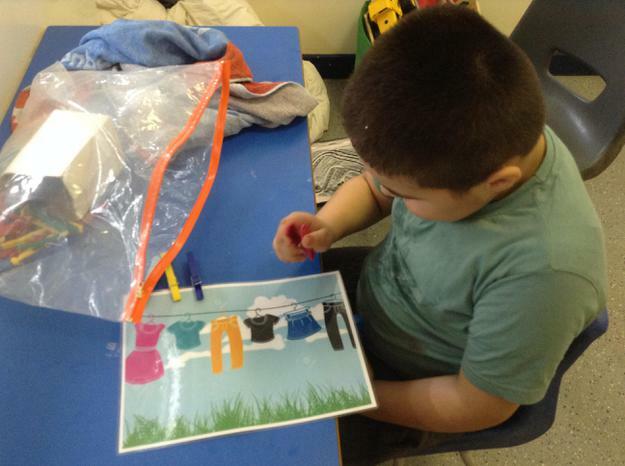 Lots of our activities have been based around our sensory story about a day at the seaside and the children have been working on their listening and understanding when following simple requests related to the story props. 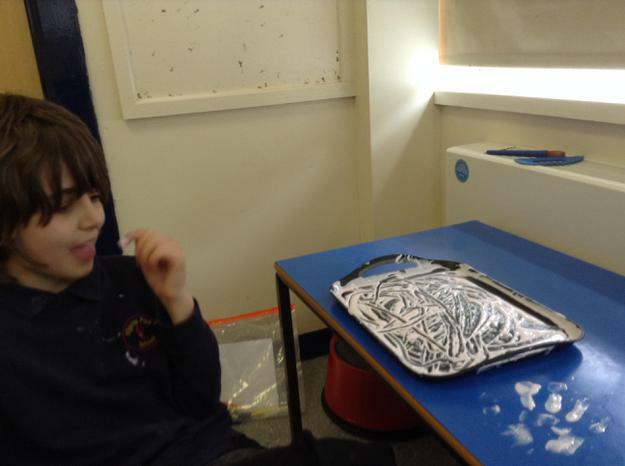 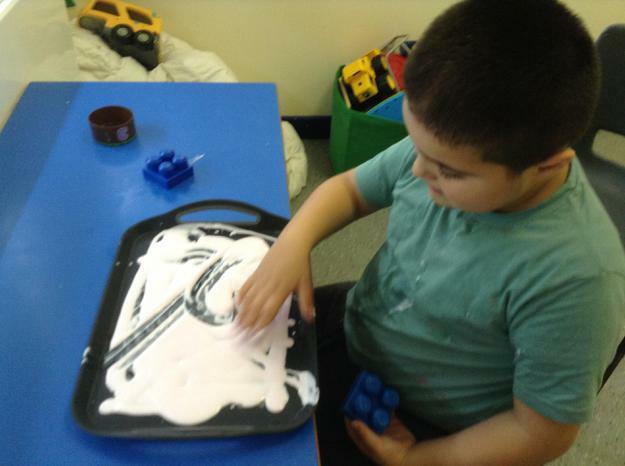 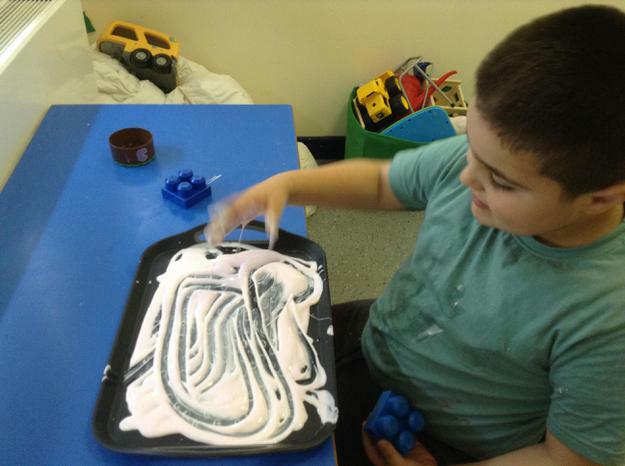 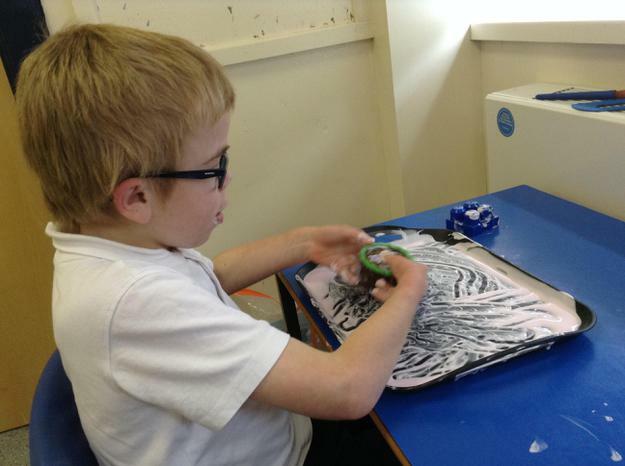 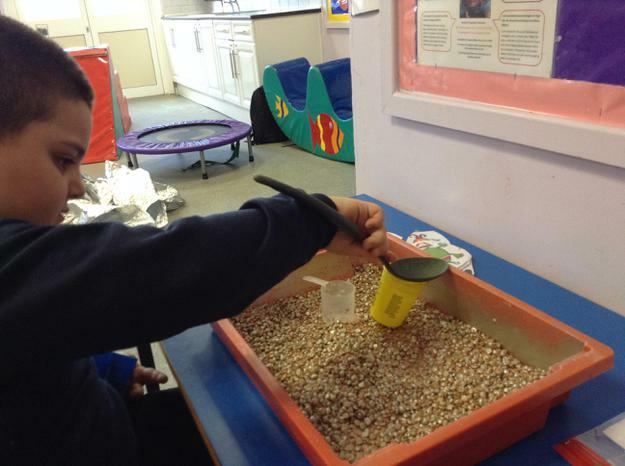 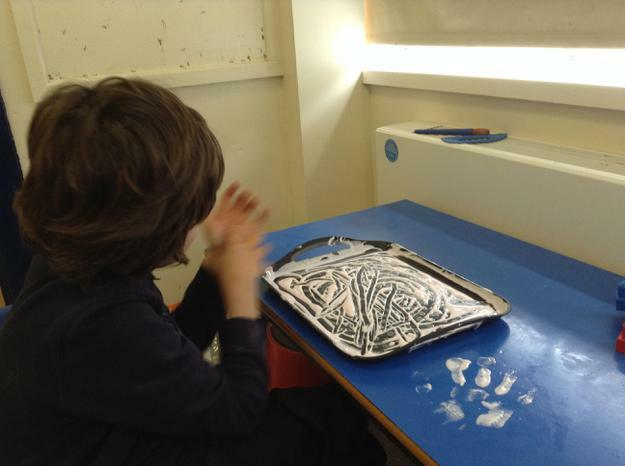 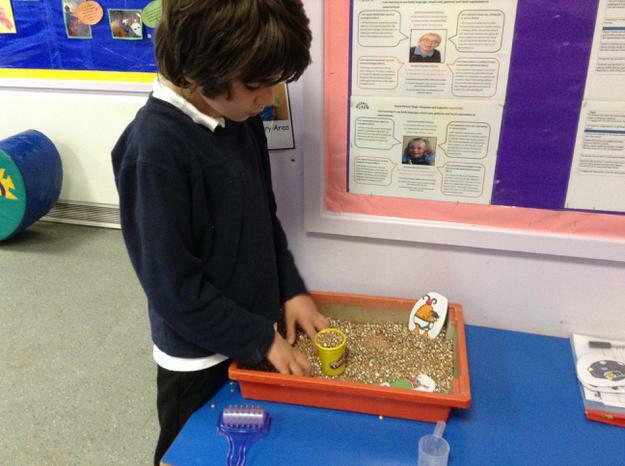 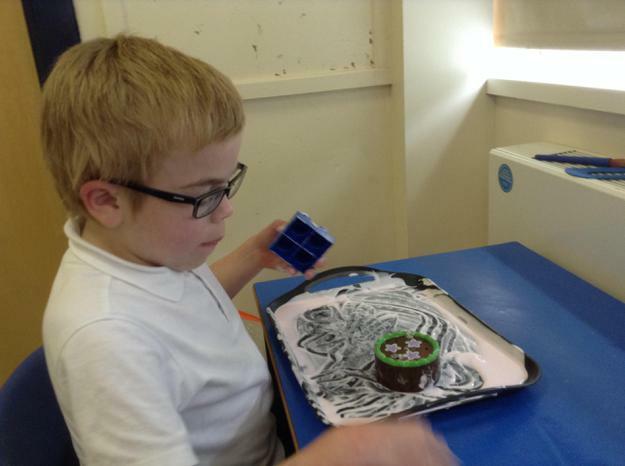 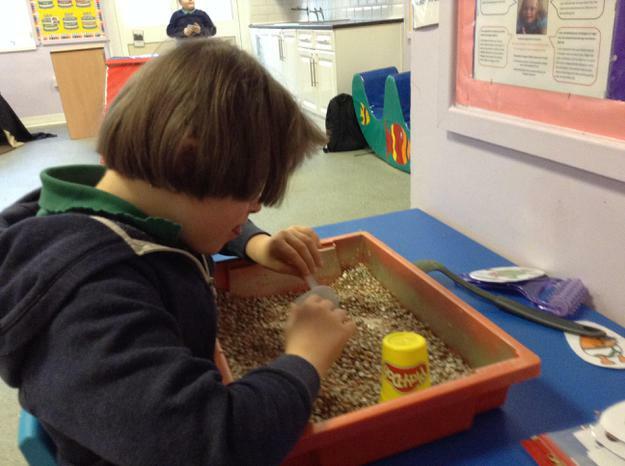 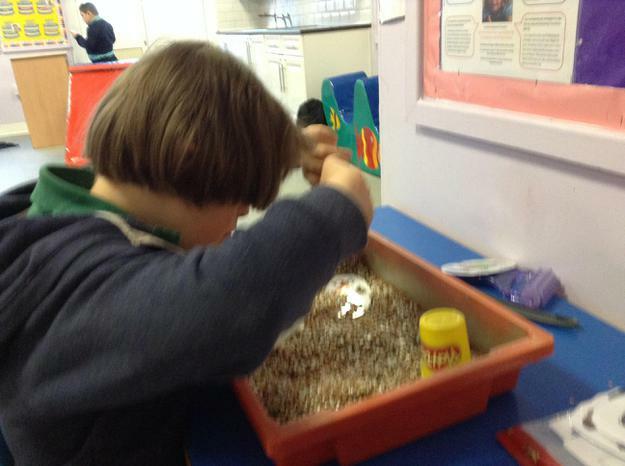 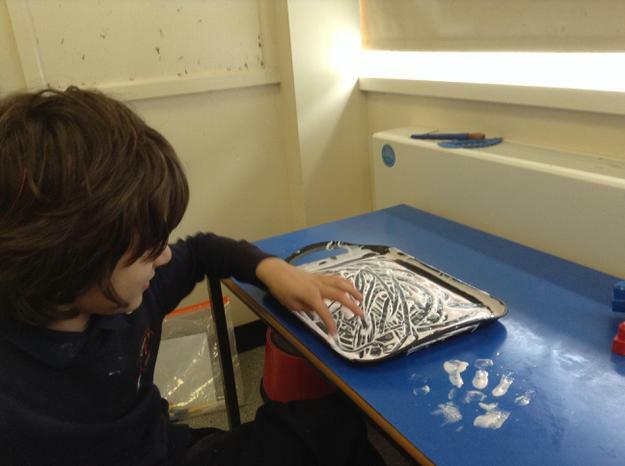 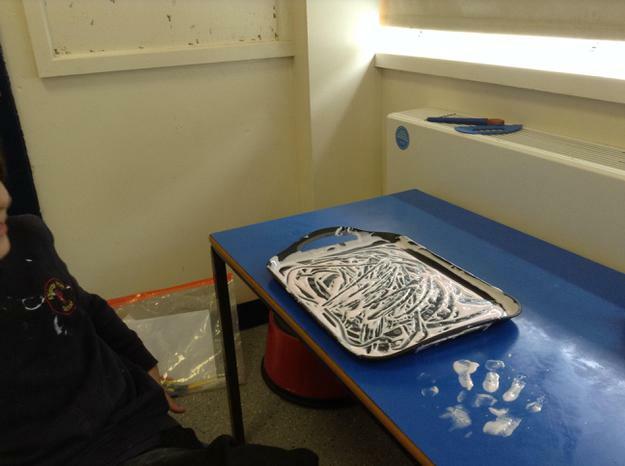 We have also enjoyed mark making in different stimuli such as sand, sun cream and shells. 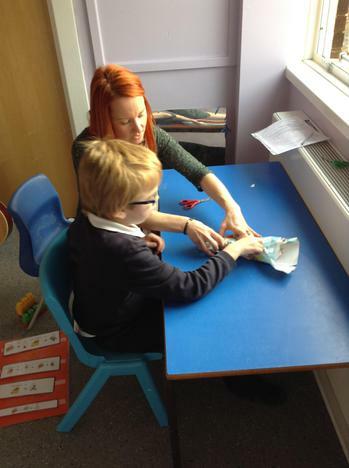 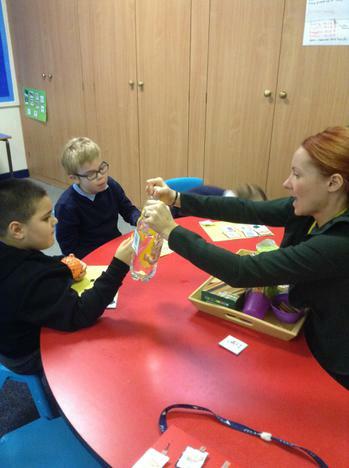 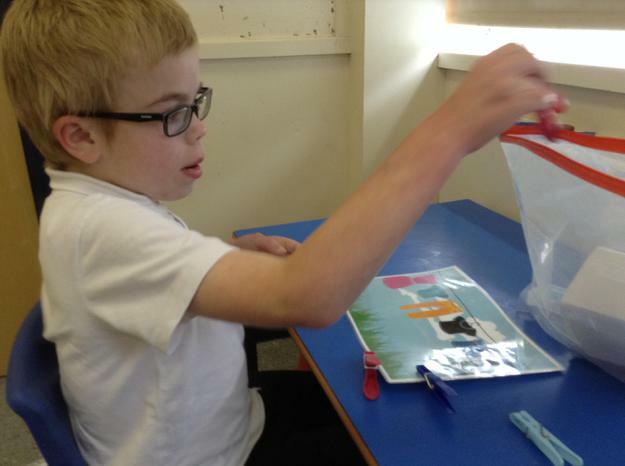 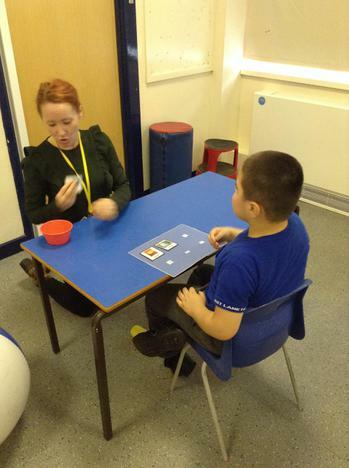 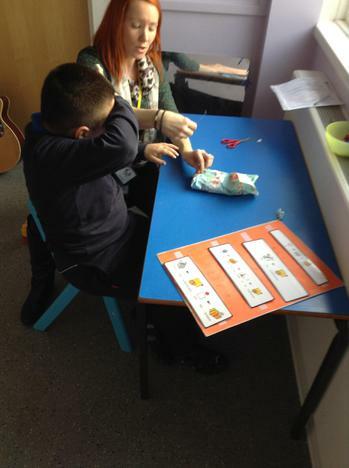 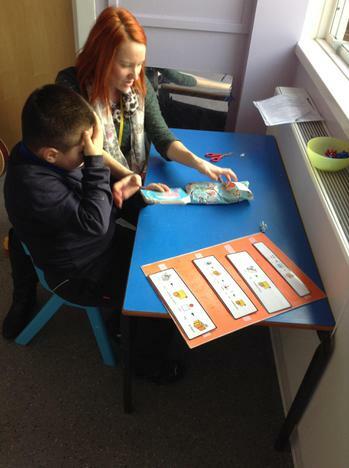 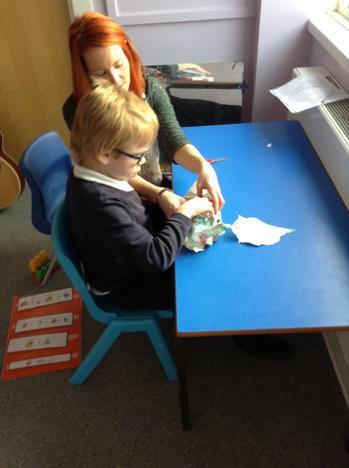 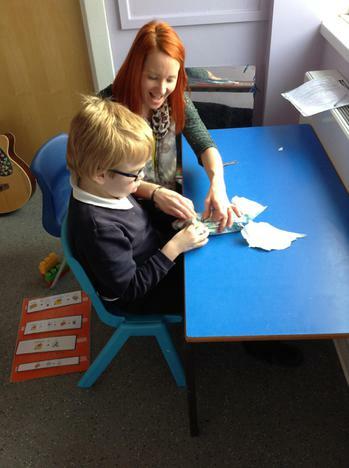 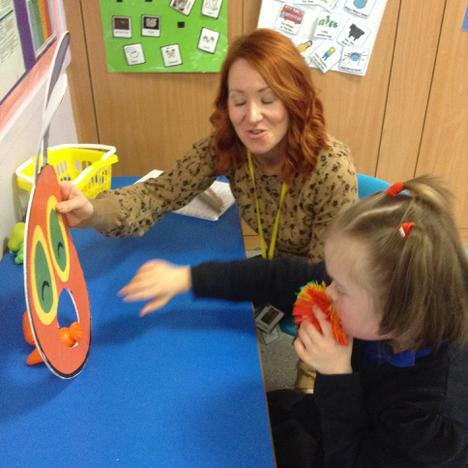 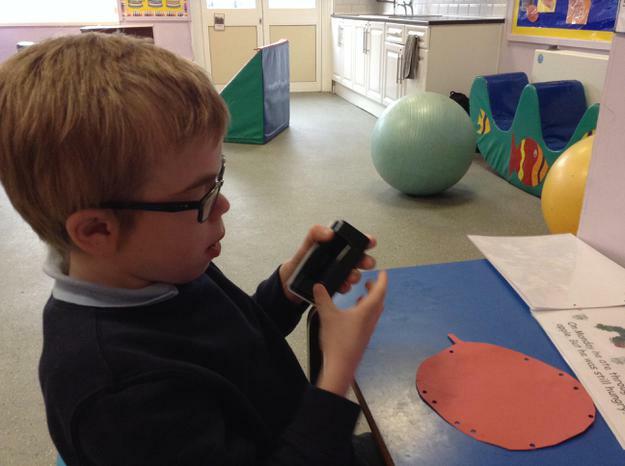 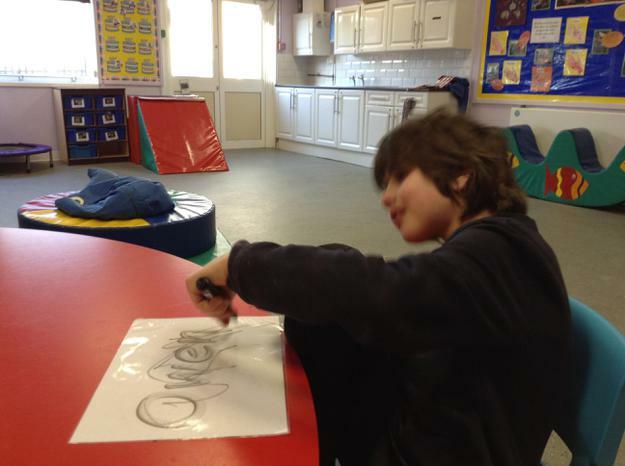 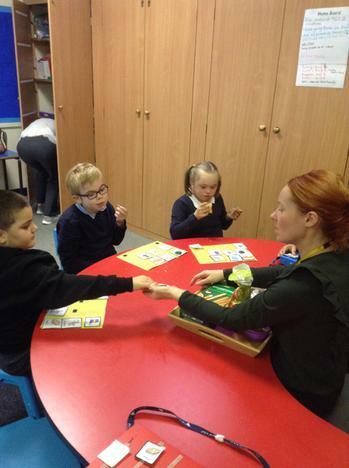 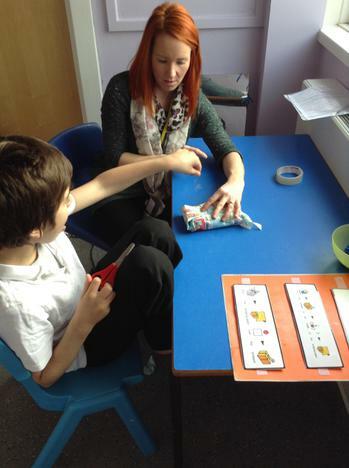 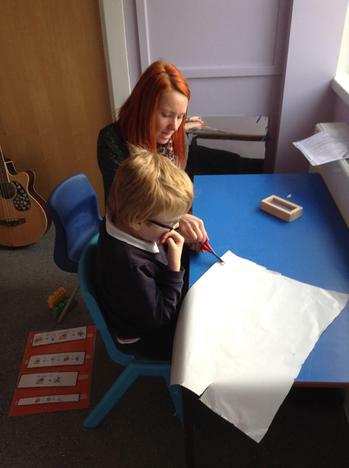 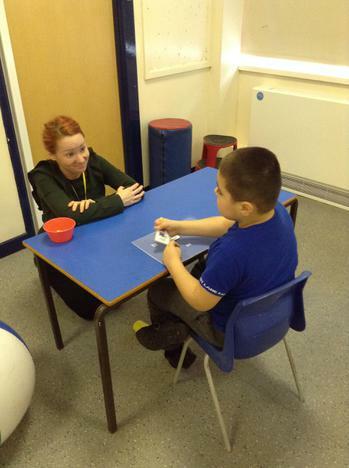 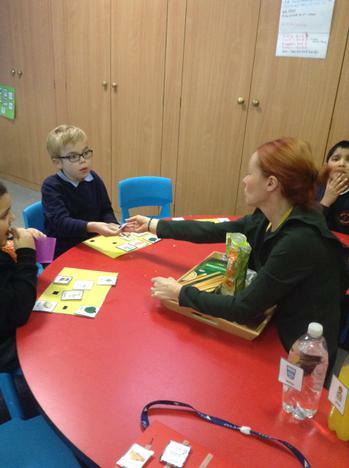 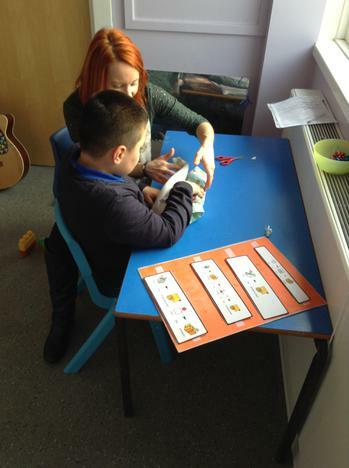 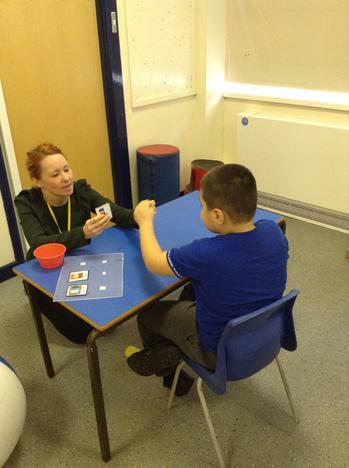 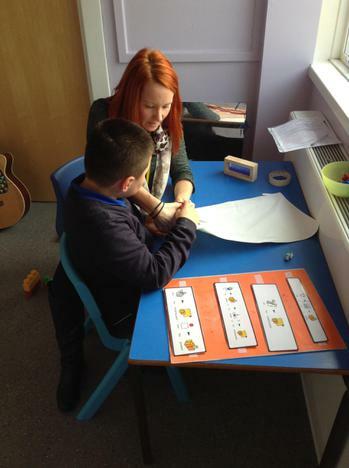 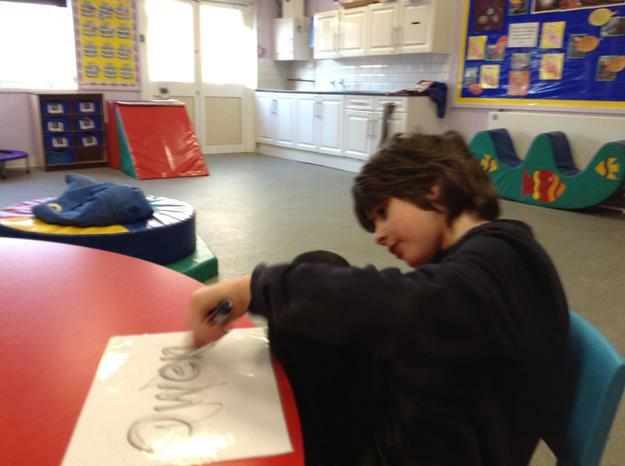 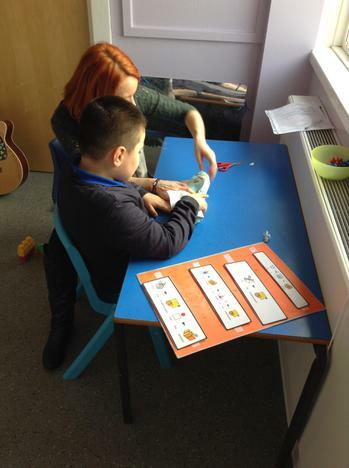 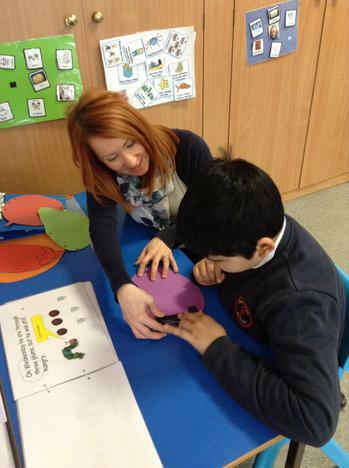 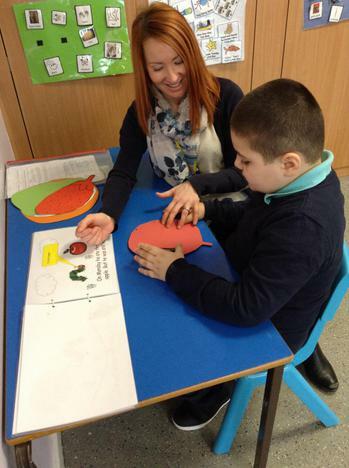 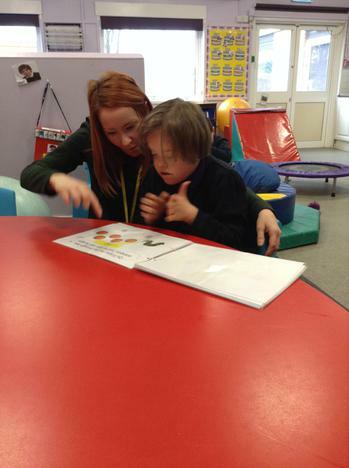 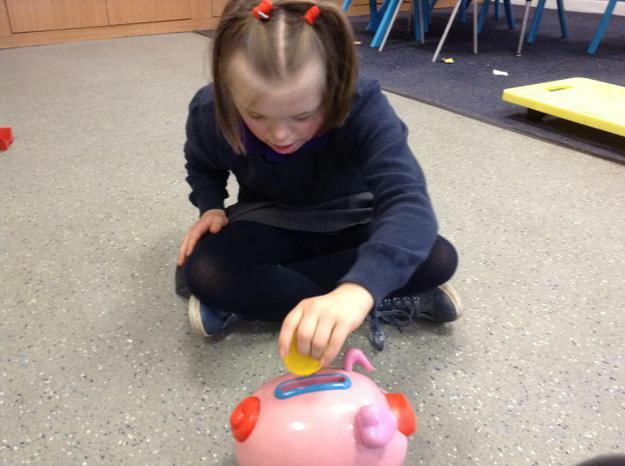 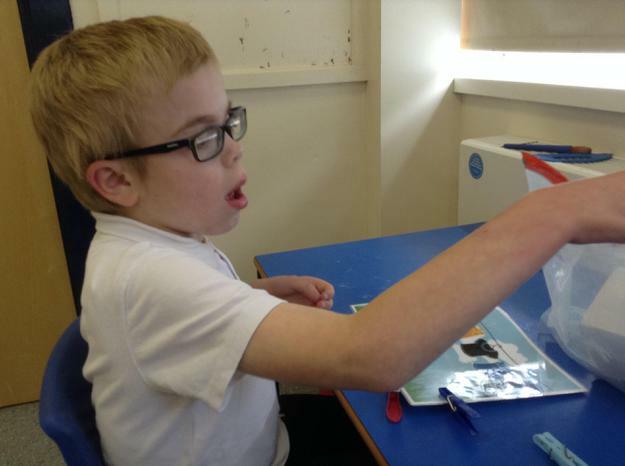 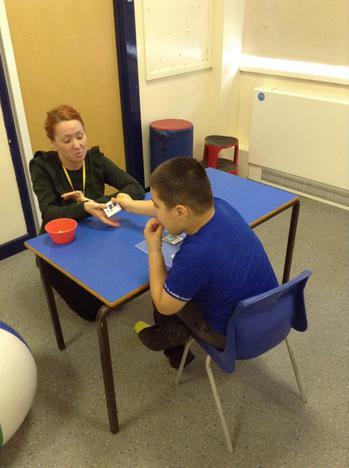 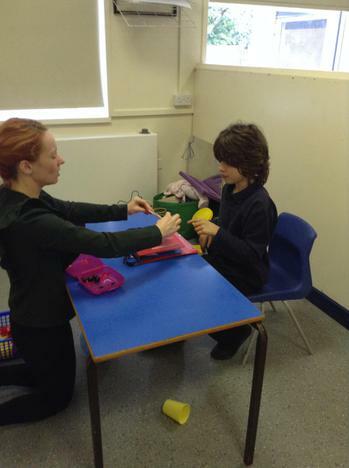 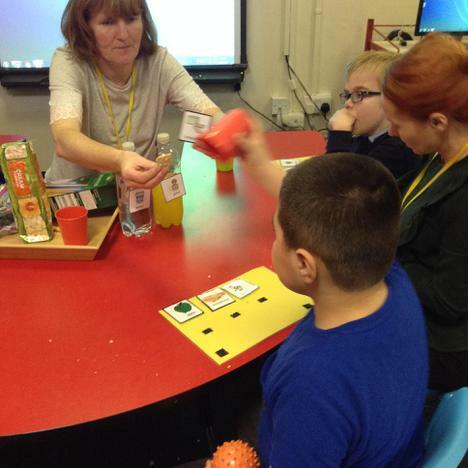 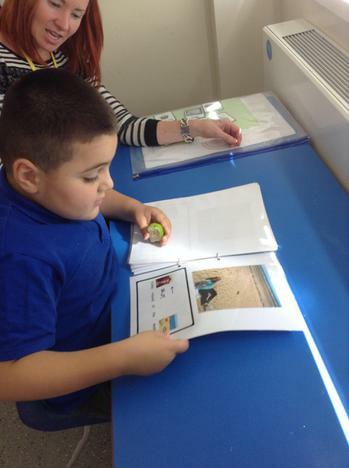 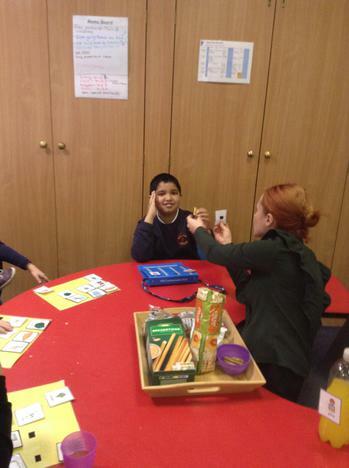 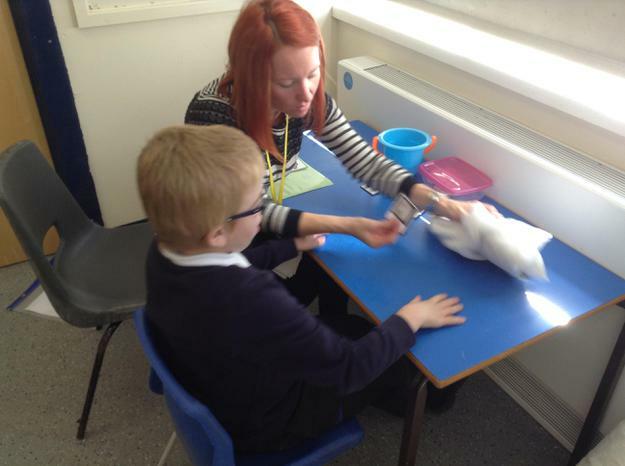 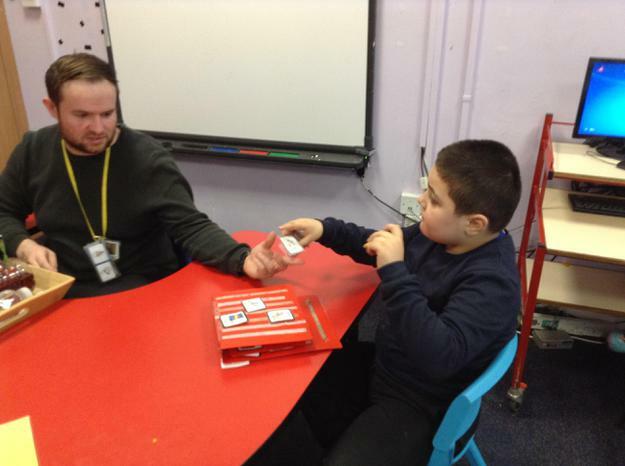 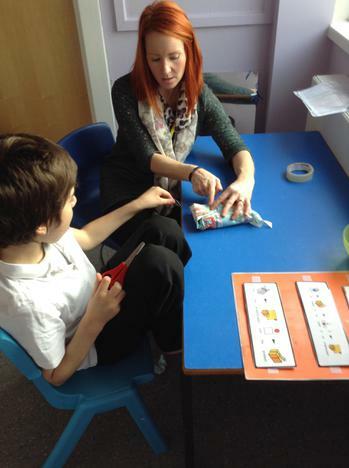 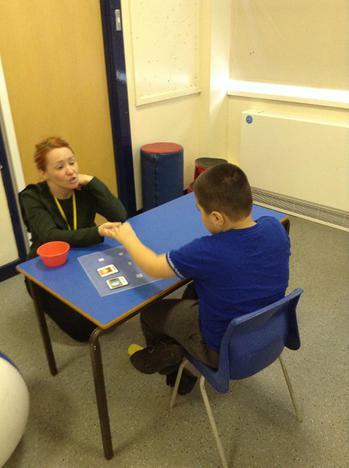 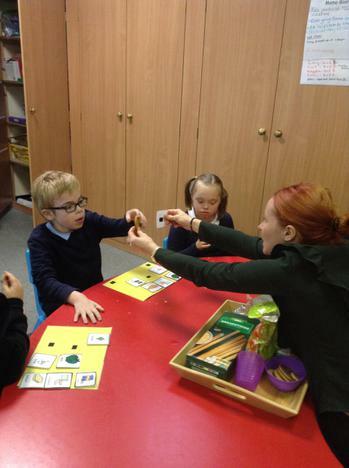 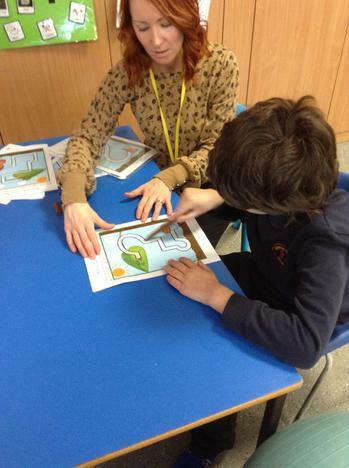 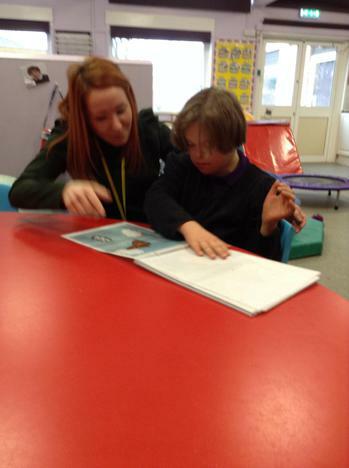 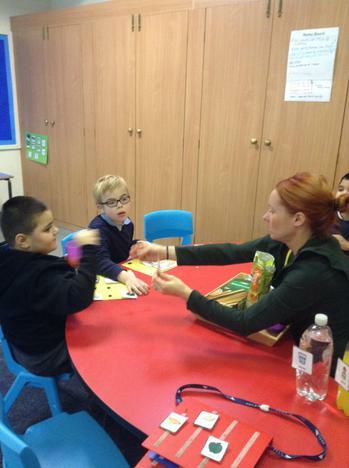 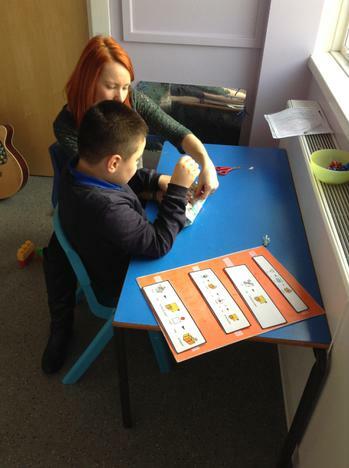 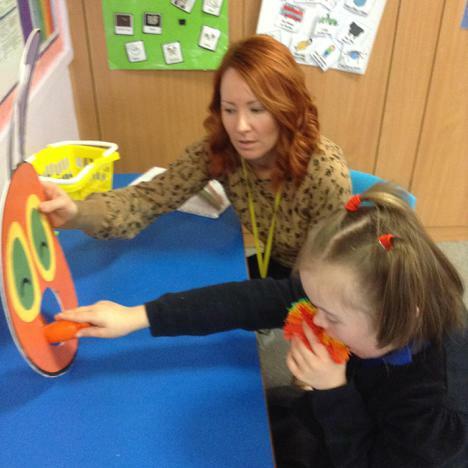 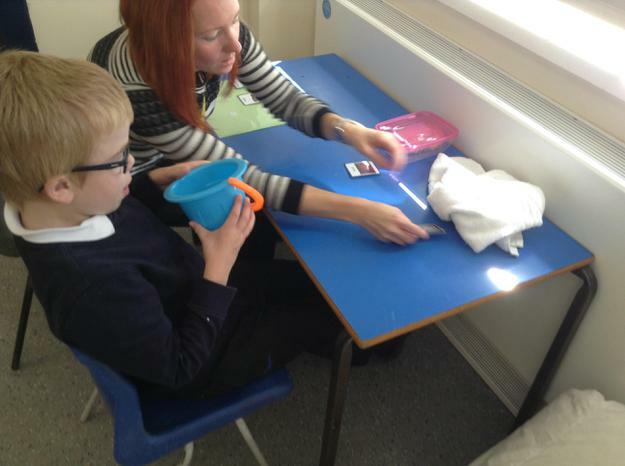 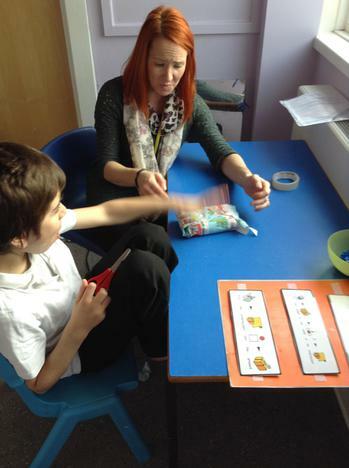 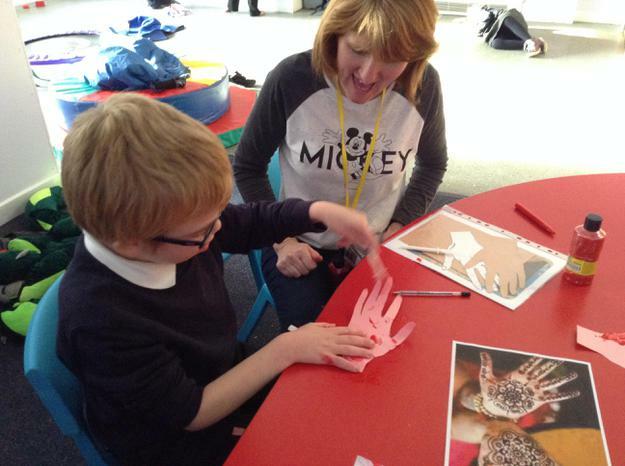 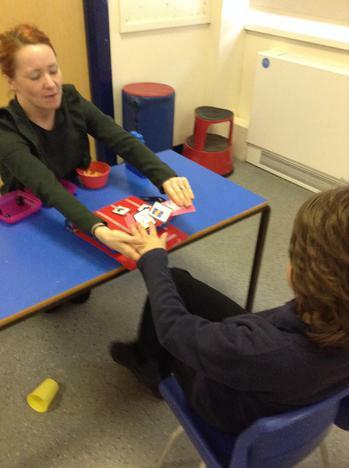 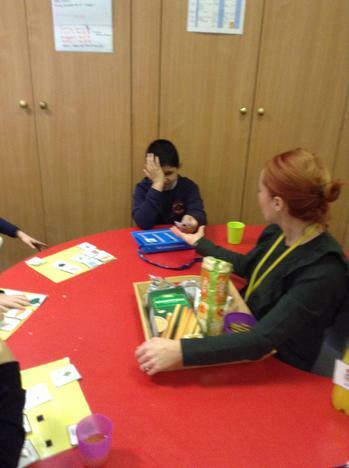 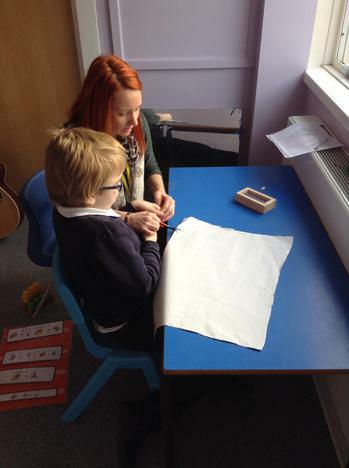 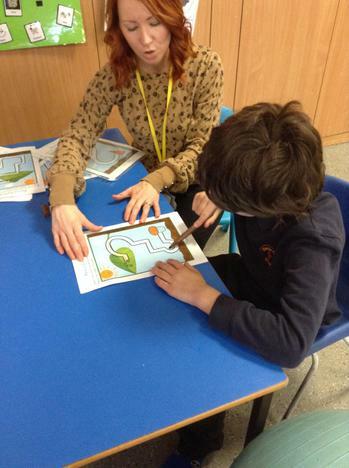 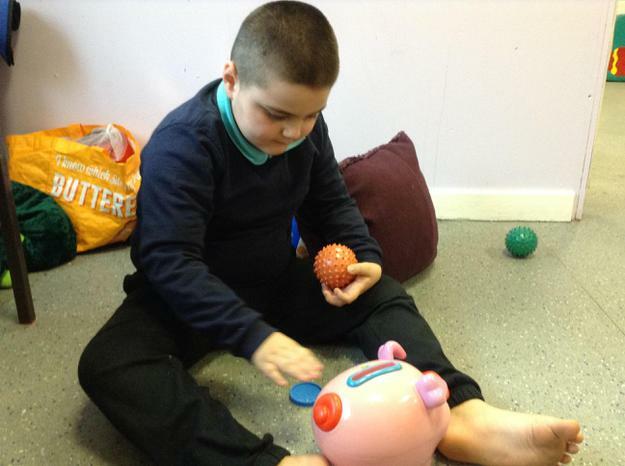 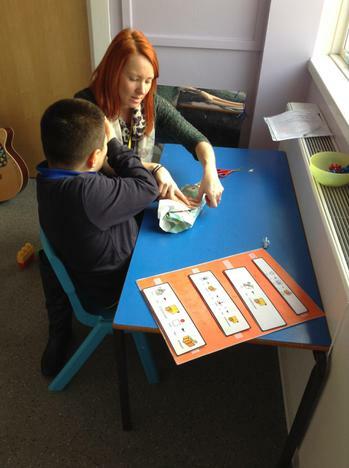 Developing the children's communication skills is a huge part of our day in Aqua class. 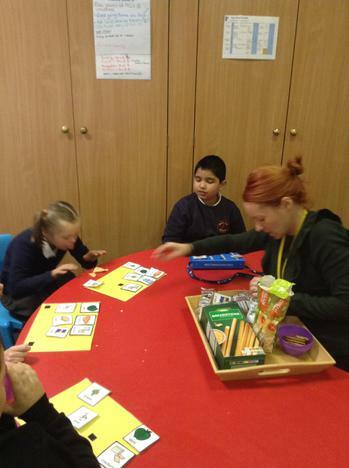 We use symbols consistently at snack time. 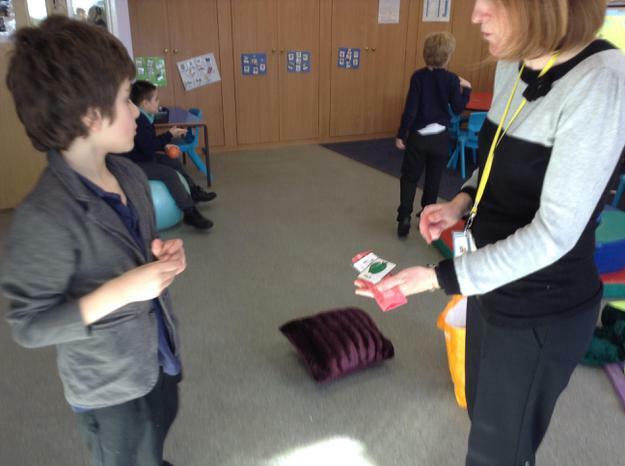 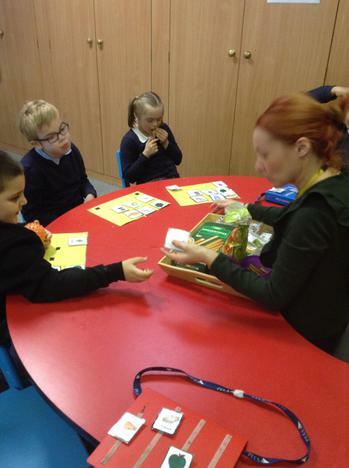 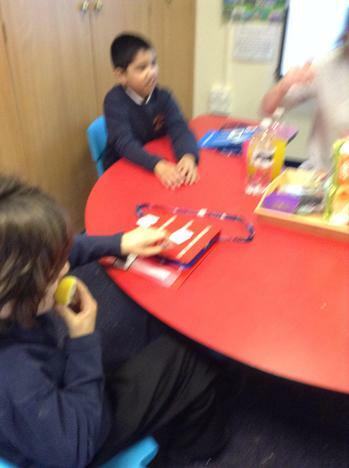 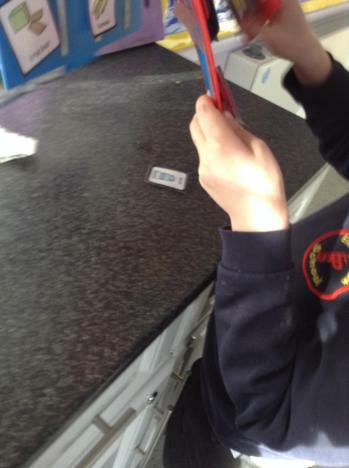 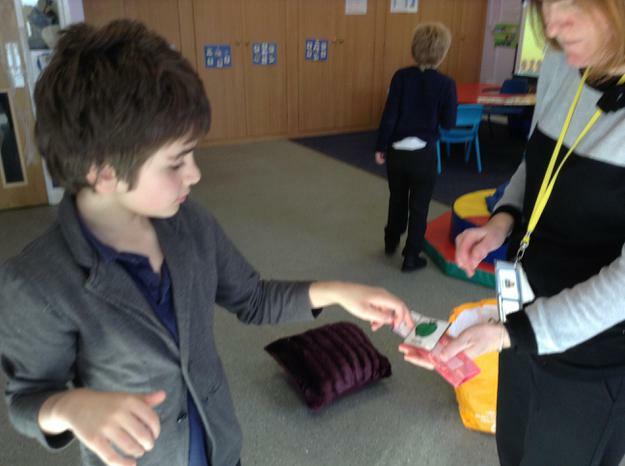 The children have learnt that they have to exchange a symbol with an adult to get what they want. 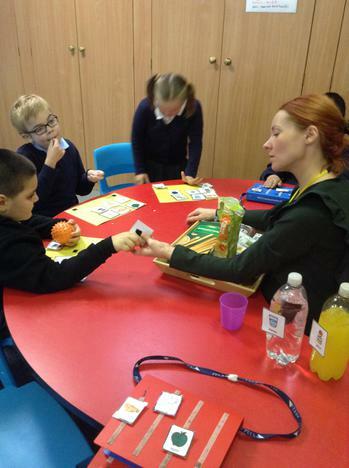 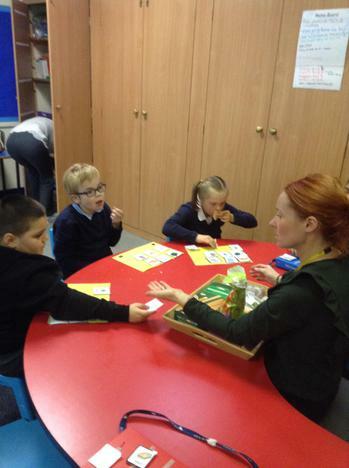 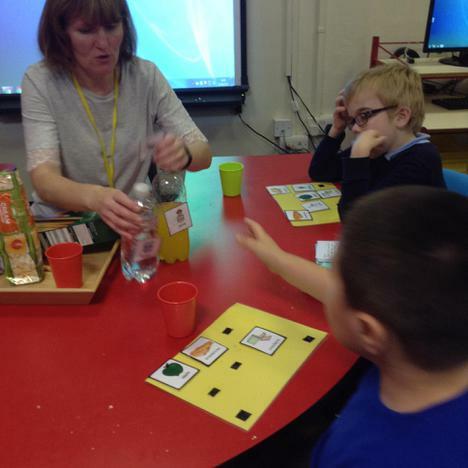 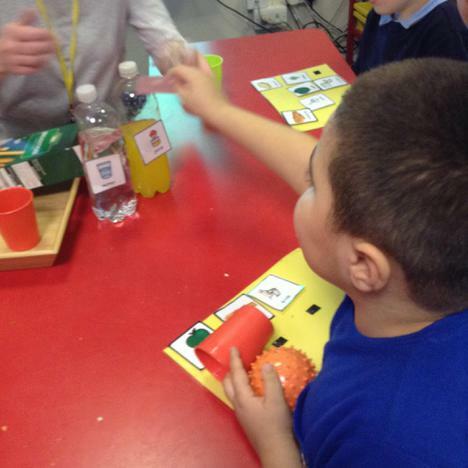 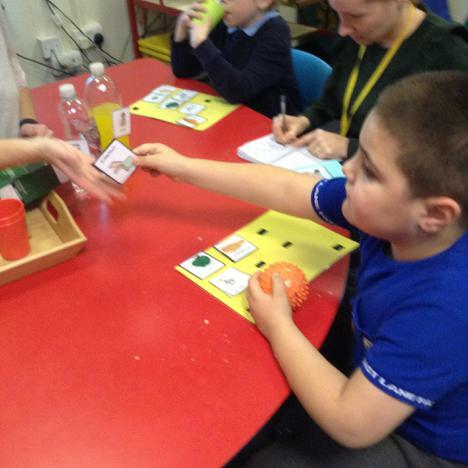 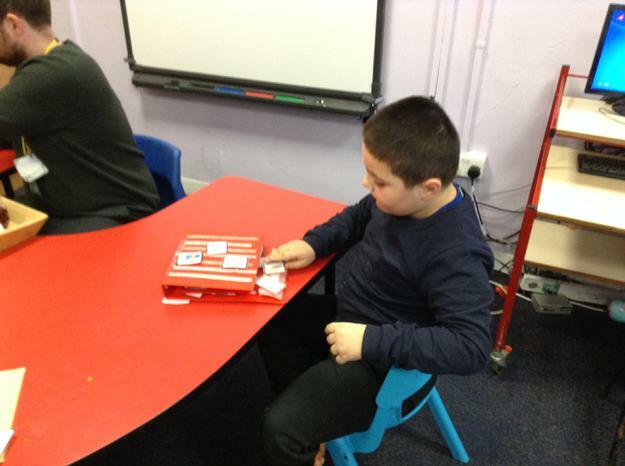 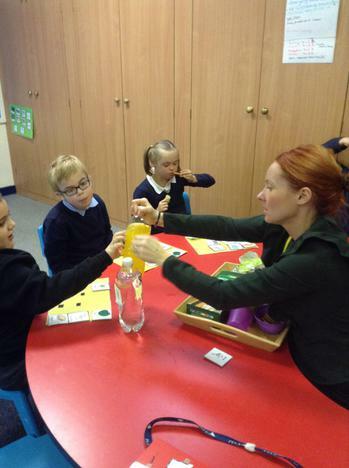 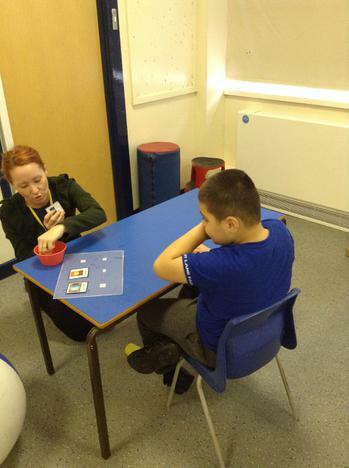 The children are always given a choice of different food and drink so that they can begin to make choices and to start discriminating between different symbols. Everyone is making excellent progress in this area!